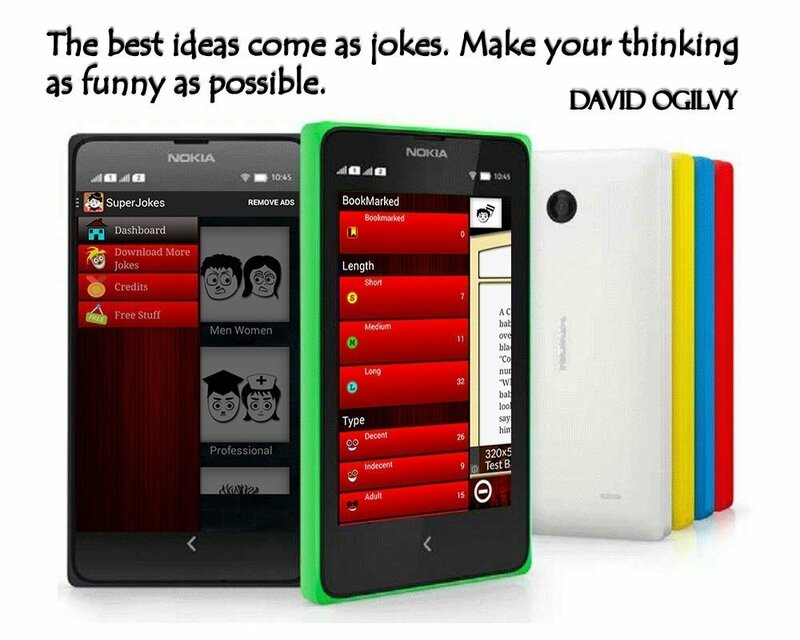 I recently developed an android application Superjokes which is.. if I say so myself.. the best jokes app with a rich selection of Jokes of all kinds. In one of the activities, I had to create a sliding menu using the support v4 library. Sliding menu is a simple menu which is generally invisible when the activity first becomes visible. It becomes visible only on a button press. You can see the example screenshot of what I created in Superjokes application.. go ahead and download it if you would like to see how it works..
As you can see, this is different from normal sliding menu as , it does not overlap the activity but it moves the activity to this side. This is a simple tutorial of how I created the Sliding menu. First we need to create our own implementation of a linear layout which will mainly be responsible for animation and creation of the sliding menu. Create a class called MainLayout and extend LinearLayout. Unfortunetly the images used in the app are copywritten so I am not sharing them here so if errors pop up wherever I have used @drawables, replace them with yours if you are infact creating the exact same thing as my activity. Now in your styles.xml file (in res->values folder), add a new style. You can change the drawable above (background_dash_drawer) to whatever you need as a background to your drawer. In my case it was a simple wood texture that you can find freely if you do google image search. Now, Inside your DisplayActivity, extend FragmentActivity (I am using support fragment library but you can use the other non support library if you are not supporting the older android apis). The variables BookmarkedCount, ShortCount, LongCount, MediumCount are integers that I calculate within my code. You can replace those with any integer for testing purposes. Since each row of your sliding menu listview contains an image, text and a number, we will need to create a custom adapter. We will call this adapter NavigationDrawerListAdapter . First we will create a class that defines the structure of our row of listview. We call this class NavDrawerItem. Now copy and paste below code in your NavigationDrawerListAdapter file. Your code should compile well now! In case of any issues.. please add to the comments and I will try to answer them..
Learnodo is a fictional character from Arun Rawat's upcoming fantasy novel series. He is best known for the knowledge revolution in another realm. Learnodo was born in a small village of Sarashi in the country of Zanesha in Pharenan (A world existing parallel to Earth). He came from the family of renowned blacksmiths.